Today was also prep day, which means I’ve been in the kitchen getting meals and food ready for both dinner and the week to come since I got home from the grocery. While one daughter laid down for a while then enjoyed a bath, the other played Operation and Clue Jr. with her daddy at the kitchen table. It was a lovely day. Now, for this week’s menu. There’s nothing on here that isn’t Paleo. $100 budget. And now for the receipt. Notice I entertained two grocery markets today… a sunday… what was I thinking? However, I wanted to give Wegman’s a chance. Local friends are typically split between the two largest competitors in the area and I have to say, I’m sticking with GIANT for the majority of my shopping. I will continue to use Wegman’s to stock up on grass-fed proteins though. Their variety is to-die-for compared to what GIANT is currently offering and their prices are not insane. I was also a bit blown away by the Gluten Free section, although as I perused, I realized it was just more processed crap that I’d rather not eat. They had a few lower prices on certain items like Almond Flour, but their Coconut Flour inflation made up for it. Also, their gluten-free, non gmo cereals were priced at or higher than GIANT. Since I knew GIANT had Barbara’s brand on sale, and their organic apples (#1 on the Dirty Dozen) were dollars cheaper, I made up my mind that I would stop by on my way home… since it is on my way home. 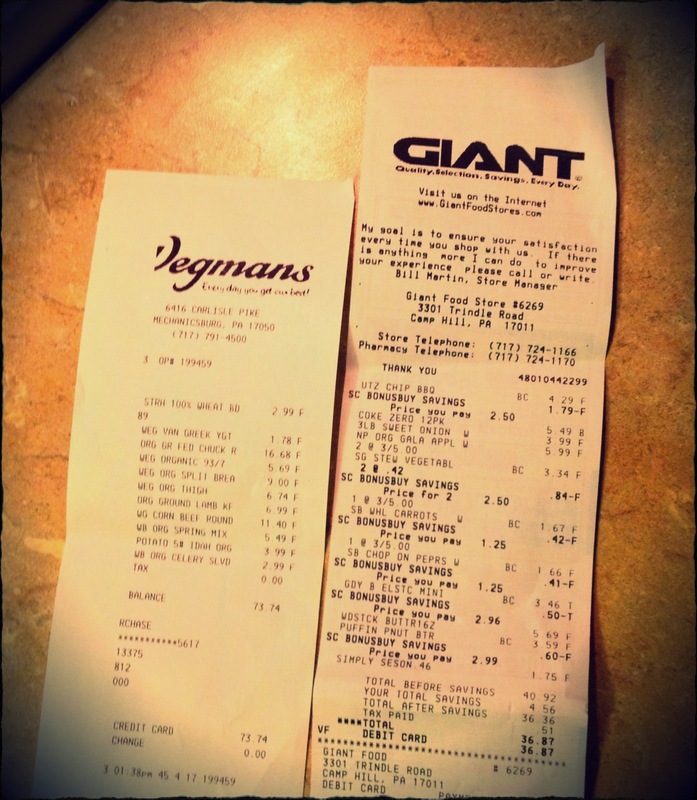 Kudos to Wegman’s for their compact receipt. I spent 70% of my budget there and got 30% less paper. I went over budget by $10.61 today, the most I’ve ever gone over. I only have myself to blame, of course, deciding to ask my husband if he wanted lunch meat when I got to GIANT. His response was “No. Bread, soda and chips.” DARN! The soda and chips alone were $8.19 and I bought my daughter a new pack of hair bands for $2.96. Without these items I would have spent $99.46 between 2 stores. From the meats I purchased, all were Wegman’s Organic Brand . I also made sure to buy meats that would prepare well for more than one meal. For example, I knew I could use the leftover chicken quarters for a salad addition, we’d have roast beef for lunch and/or a leftovers dinner as well, OR I could use it in a stew. Always make leftovers! Chicken wings marinated in Frank’s Hot Sauce, onions, bell peppers, butter, salt and pepper. Baked for dinner at 350 for 45 minutes, turned and brushed twice. Chicken quarters baked at 350 for 70 minutes with butter, salt and pepper. Turned and brushed twice. 4 large meatballs, 8 medium meatballs and a heart-shaped meatloaf made from 2lbs of ground beef and 1lb of ground lamb. Added to the mixture: 2 eggs; 1/4(ish) cup of coconut flour; (in the food processor) carrots, onions, celery, dates; salt, pepper, thyme and savory seasoning. All sprinkled with garlic salt. A salad for my work-dinner tomorrow night was prepared while I made dinner salads. I added some of the extra roasted chicken to it after dinner was complete. Mashed white (for husband) and sweet potatoes. 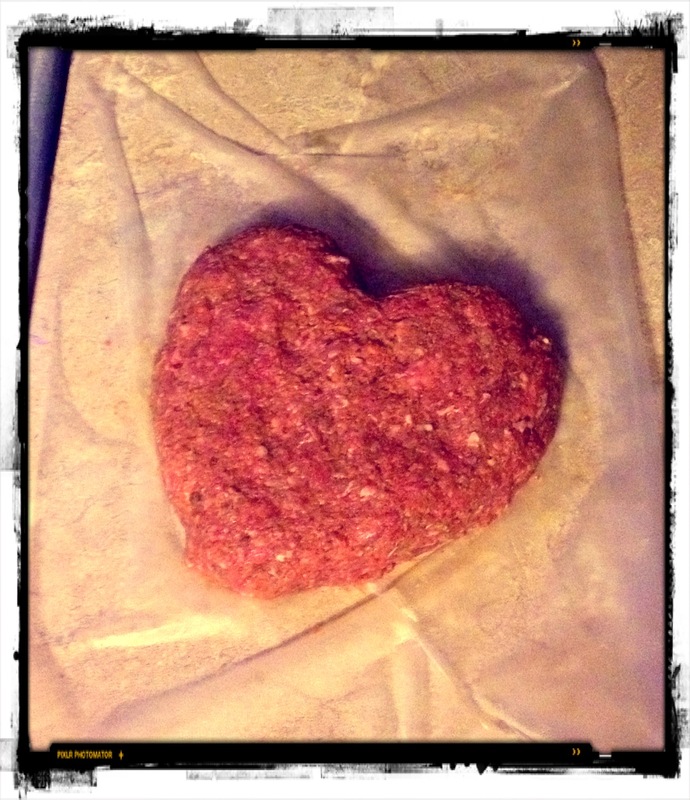 I shaped my meatloaf into a heart to send my love to the fam while I am working. Thanks to Liz for the idea! It’s her Valentine tradition. After making a whole lot of dinner to satisfy each of our cravings (not my typical m.o. ), we have half a dozen wings, 1 quartered chicken plus part of a quarter, and extra mashed potatoes for daytime meals and/or leftover night. Tomorrow, while I am enjoying my protein packed salad, my family will enjoy a meatloaf. I hope to have some leftover meatloaf with an egg Tuesday morning! I forgot to boil eggs. They are such an important addition to my work-meals because of the protein and fat content. They fill me up and keep me going while on my feet. So, I’ll make time in the morning to boil a few. What is on your menu this week? Leave a comment and let us know, or join us on our Facebook page to further the conversation.